Rules Guy: Can my partner help me hit a shot so I don't injure myself? Rules Guy: Can my partner help me hit a shot so I don’t injure myself? While playing at my home course, I hit an errant shot about a foot from a water hazard on a severe slope. At 81, my balance isn't what it used to be. Could I have asked a fellow player to hold onto me as I backhanded the shot, to keep me from falling? 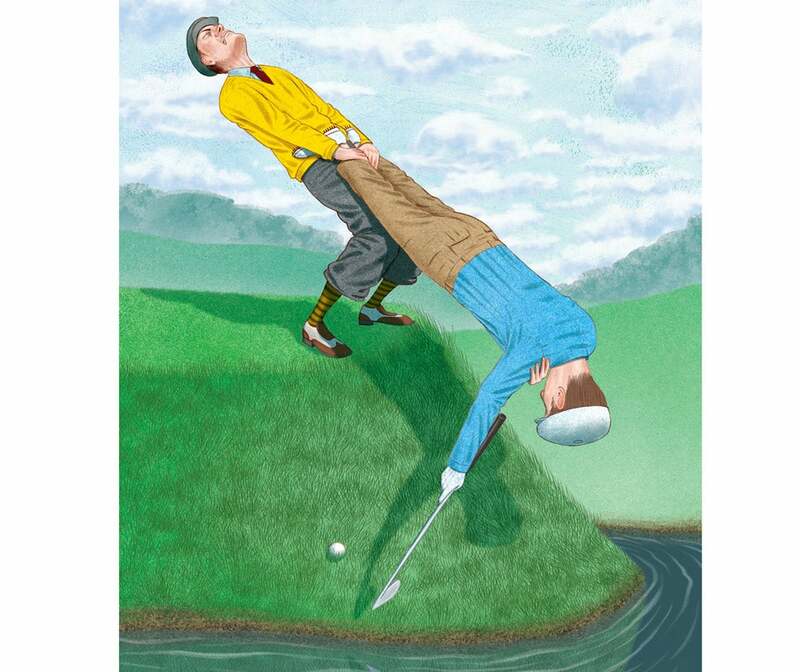 —RICHARD SCHEMANSKI, NOKIMIS, FLA.
Alas, Richard, this type of balancing act runs afoul of Rule 14-2a regarding physical assistance — you'd have been penalized with two strokes in stroke play and loss of hole in match play. That said, this rule doesn't apply prior to a stroke, so you can ask for help getting into position. The Rules try to help us creaky types in other ways, too: Another player can retrieve your ball from the hole or even tee it up for you (on the teeing ground, of course). Discretion being the better part of valor, if two club-lengths from the ball no closer to the hole puts you back on firmer footing, consider that route at the cost of one stroke under Rule 28c; otherwise, your safest bet is stroke and distance — a penalty loathed by young and old alike. This summer we were playing at Trump Aberdeen in Scotland. My competitor was in a greenside pot bunker. His ball was very close to the bunker's back wall, which was layered grass. On his backswing, the club touched the grass wall. He continued the swing and got the ball out on the green. I said penalty; he disagreed. —MARC MANIN, DELRAY BEACH, FLA.
What defines a "wall"? A vexing question off the course, less so on it. Under the Definition of Bunker, the grass-covered wall isn't in fact part of the bunker. It is not a breach of Rule 13-4 (covering prohibited actions with a ball in hazard) to touch ground outside the hazard in the backswing when the ball lies in the hazard. Had your competitor's club instead touched the ground or a loose impediment in the hazard during the backswing, he would have been in breach of the above Rule, with loss of hole in match play or two strokes in stroke play. ​In a tournament, my fellow competitor's ball landed on a cement cart path with his ball touching — but not over — a red line lateral hazard. He argued for free relief, since his ball was on the cart path. We said he had to take a stroke penalty if he wanted to take a drop. Who is right? —TYRONE E. DICKERSON, RICHMOND, VA. Politicians often threaten retaliation for crossing red lines; in golf, just touching a red line itself brings consequences. A ball on or touching the line defining a lateral water hazard lies in the hazard, so per Note 1 to Rule 24-2b, the player gets no free relief from interference by the cart path, immovable obstruction though it indeed is. The ball must be played as it lies or, as you pointed out, the player can, with a one-stroke penalty, take relief under Rule 26-1. I recently crushed a drive down the middle with a slight draw. The ball came to rest about six inches from a red-stake hazard. I needed to stand in the hazard in order to play the shot. Exactly where I needed to place my feet was a long, skinny branch. Since my ball wasn't in the hazard, could I have removed this loose impediment without penalty? Or did I need to balance atop the branch? —RON FRITCHER, ROCHESTER, MINN. Hang on a minute, Ron — how does a center-cut drive with a "slight" draw end up inches from a lateral hazard? Was that a "slight" exaggeration? Regardless, under Rule 23-1, since the ball and loose impediment don't lie in or touch the same hazard, the loose impediment may be removed without penalty. Nice to be reminded that the Rules of Golf don't always make us feel slighted. Of course you do! Whatever it may be, send it to [email protected] and the question may be answered in an upcoming issue of GOLF. Until then, play by the Rules!